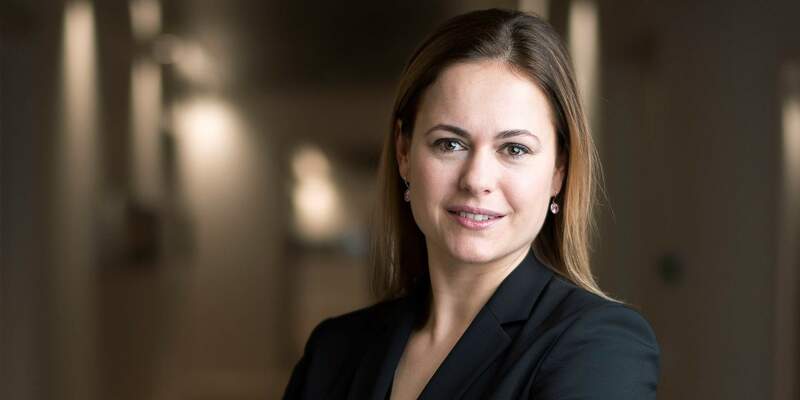 Anke Bridge Haux, Head of Digitalization & Products at Credit Suisse. Future scenario 1: New store concepts will concentrate on biometric payments and sophisticated client loyalty programs. The cash register will disappear. Iris, facial, and fingerprint recognition will make passwords redundant and payments even simpler. What do you think: Go or no-go? Anke Bridge Haux: It's no longer a matter of science fiction that financial transactions can nowadays be done using fingerprints, selfies or iris scanning instead of entering a traditional password or PIN. I myself am an advocate of such innovative authentication procedures, which have the advantage of improving both payment security and the user experience. In my view, banks need to look closely at this. Nonetheless, the fact remains that Switzerland is a country of cash, even though card payments are now widespread and mobile payments have seen impressive growth rates. The situation in Scandinavia is completely different. For example, it is said that in Sweden even church collections can be paid by credit card. This shows that digitalization is a development that is not only driven by technology, it is also a social process. What the future holds for cash in Switzerland. of Swiss people think that fingerprints are the most secure form of verification, followed by iris scanning and facial recognition. Visa digital payment study 2017. In Japan, a pilot project is currently under way for making payments using your fingerprint. If the system proves itself, the payment method is due to be introduced at the Olympic Games in Tokyo in 2020. The credit card company Mastercard is also testing a new generation of credit cards in South Africa: Instead of entering their personal identification number (PIN) or signing, cardholders have to place their finger on the scanning area on the card and the transaction is confirmed. With the Mastercard Identity Check app, clients can make so-called selfie payments. This enables payments in online shops to be confirmed by means of facial recognition on a smartphone camera. Future scenario 2: Another scenario is based on the idea that people still attach great importance to discussing financial matters with a person they trust. And so, in the bank of the future, the focus will be on people and not on money. Anke Bridge Haux: The personal interaction between client and advisor will continue to play a pivotal role in banking – whether it's via digital channels or in direct contact. We are aware that many of our clients still place great value on interpersonal contact. Therefore, we divide our clientele into those with "high-touch" personalities on the one hand, who prefer face-to-face contact with their advisor, and those with "high-tech" personalities on the other, who are very interested in the technological options that are available. For us, it is very important to ensure that all our clients are satisfied, regardless of their approach. Because, despite all the changes, banking is and will continue to be based on trust, and trust is a matter of the personal relationship between the client and the bank or the advisor. Despite all the changes, banking is and will continue to be based on trust. What other scenario or issue will affect the banking sector in the future, in your view? Anke Bridge Haux: For me, it will be big data in particular, combined with artificial intelligence. Nowadays, we are able to gather and analyze complex information quickly, and then take decisions almost immediately. This enables us to tailor and personalize services, and thereby to create optimal solutions for clients based on their investment objectives, risk tolerance, and financial limitations. For example, people who use a credit card today receive a monthly overview of their spending. But thanks to new, data-based technology, we can tell the client much more. For example, we can calculate in real time the effect of payments that clients make on their personal budget. In this way we can help clients to work out their fixed costs (such as bills, digital subscriptions, etc.) and to manage their personal spending so that they avoid exceeding their budget. The benefits for both sides are significant.